Trump is ordering the US Department of the Treasury to slap third-party sanctions on non-US firms who do business with Iran. Companies like Total, S.A., the French oil giant, who do business with the US, cannot afford to buck the Treasury Department and so are pulling out of planned Iran investments. Smaller European firms that do not do business with the US and who can use Euros or some other currency and go through non-US banks could conceivably go on doing business with Iran with no exposure to the wrath of the enormously powerful Treasury Office of Foreign Asset Control. China’s gas giant Sinopec has said it will defy US sanctions, as has the Turkish foreign ministry, and Russian officials and concerns also reject Trump’s bullying. While the Indian government has warned the country’s corporations to be ready for anything, New Delhi will make a stand for economic independence of the US and plans to buy Iranian oil with rupees. The US Treasury Department only has authority over dollar exchanges, and over banks that have branches in the US or do business with the US. Iran gave up perhaps 90% of its enrichment activities, keeping only a small number of centrifuges and enriching uranium only to the 3.5% needed to run its 3 Russian-built nuclear power plants at Bushehr. Tehran has therefore demanded economic guarantees from the remaining signatories. 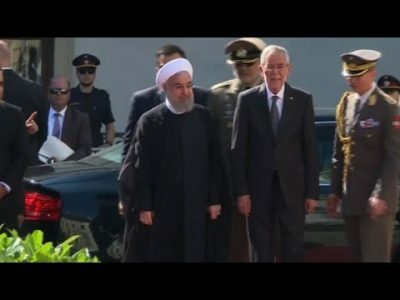 Iranian president Rouhani has made a lot of blustery threats about what will happen if Europe reneges on the JCPOA, including that Iran could start back up its more ambitious enrichment program, and, more recently, could interfere with oil and gas exports from the Gulf (from which 22% of world petroleum originates). Iran is saying that if it cannot export its oil from the Gulf, then it can’t see why its enemies like Saudi Arabia and the United Arab Emirates should be allowed to. It is hard to imagine such a scenario. Even during the Iran-Iraq War of 1980-88, relatively little oil sabotage took place, because each side was afraid of lasting damage to its own industry. But that Iran could resume its enrichment program is entirely plausible. And that Iran could turn spoiler is also plausible, though in less overt ways.